The MaxLight PW-165 Pre-Inked stamp with a print area of 1-1/2″ x 2-7/16″ offers near print quality in a self-contained stamp. 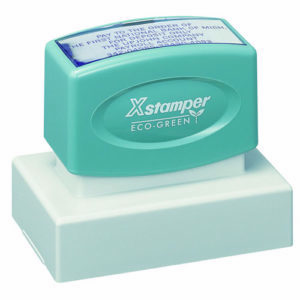 Just push down on the stamp mount to create crisp, clear impressions. MaxLight Pre-Inked stamps are recommended for notaries, document control, professional engineer and signature stamps. The MaxLight PW-165 Pre-Inked stamp conveniently creates thousands of crisp, clean stamp impressions time after time.